Quanah Parker (ca. 1845 or 1852 – February 23, 1911) was Comanche/Scots-Irish from the Comanche band Noconis ("wanderers" or "travelers"), and emerged as a dominant figure, particularly after the 'Comanches' final defeat. He was one of the last Comanche chiefs. The US appointed Quanah principal chief of the entire nation once the people had gathered on the reservation and later introduced general elections. Quanah was a Comanche chief, a leader in the Native American Church, and the last leader of the powerful Quahadi band before they surrendered their battle of the Great Plains and went to a reservation in Indian Territory. He was the son of Comanche chief Peta Nocona and Cynthia Ann Parker, a European American, who had been kidnapped at the age of nine and assimilated into the tribe. Quanah Parker also led his people on the reservation, where he became a wealthy rancher and influential in Comanche and European American society. Quanah Parker's mother, Cynthia Ann Parker (born ca. 1827), was a member of the large Parker frontier family that settled in east Texas in the 1830s. She was captured in 1836 (at age nine) by Comanches during the raid of Fort Parker near present-day Groesbeck, Texas. Given the Indian name Nadua (Someone Found), she was adopted into the Nocona band of Comanches. Assimilated into the Comanche, Cynthia Ann Parker later married the warrior Peta Nocona, (also known as Noconie, Tah-con-ne-ah-pe-ah, or Nocona). His father was the renowned chief Iron Jacket, famous among the Comanche for wearing a Spanish coat of mail. Nadua and Nocona's first child was Quanah (Fragrance), born in the Wichita Mountains of southwestern Oklahoma. Biographer Bill Neeley cites a letter Quanah wrote late in life to his friend, rancher Charles Goodnight, in which Quanah stated, “From the best information I have, I was born about 1850 on Elk Creek just below the Wichita Mountains.” Author S.C. Gwynne supports the Oklahoma claim in his 2010 book, Empire of the Summer Moon: Quanah Parker and the Rise and Fall of the Comanches, the Most Powerful Indian Tribe in American History. However, another account disputes the birthplace, contending that in 1911 Parker was seen traveling by automobile near Lubbock, Texas, telling observers he was going to visit what he understood to be his birthplace at Laguna Sabinas (Cedar Lake) in Gaines County, Texas. Nadua and Nocona also had another son, Pecos, and a daughter, Topsana (Prairie Flower). In December 1860, Nadua (Cynthia Ann) and Topsana were captured in the battle of Pease River, which actually took place along Mule Creek. American forces were led by Sgt. John Spangler, who commanded Company H of the U.S. 2nd Cavalry, and Texas Rangers under Lawrence Sullivan Ross (better known in Texas history as Sul Ross). Quanah, his brother Pecos, and his father Peta Nocona were almost certainly not at Mule Creek. However, in an effort to further his political career, Sul Ross later fabricated a story wherein he claimed to have killed Peta Nocona at Pease River. Ross would later become a Texas state senator, and eventually governor. Meanwhile, Nadua (Cynthia Ann) and her daughter Topsana were reunited with her white family, but after having made her life 24 years with the Comanche, she wanted to return to them and her sons. However, Topsana died of an illness in 1863. Cynthia Ann Parker died in 1870. Quanah was introduced into the Destanyuka band, where Kobe (Wild Horse) took him under his wing only after his father's death, several years after Pease River. Until Nocona died, he took care of his son and raised him. Kobe (Wild Horse) taught Quanah the ways of the Comanche Warrior and he grew to considerable standing as a warrior. He left and joined the Quahadi (Antelope Eaters) band with warriors from another Tribe. Quanah Parker surrendered to Mackenzie at Fort Sill, Indian Territory, and led the Comanches successfully for a number of years on the reservation. Quanah was never elected principal chief of the tribe Quahadi by the people; it was the U.S. government that appointed Quanah Parker principal chief of the entire nation once the people had gathered on the reservation and later introduced general elections. In October 1867, Quanah was only a young man who had come along with the Comanche chiefs as an observer at treaty negotiations at Medicine Lodge. Kobe (Wild Horse) made a statement about his refusal to sign the Medicine Lodge Treaty. In the early 1870s, the Plains Indians were losing the battle for their land with the United States government. Following the capture of the Kiowa chiefs Satank, Adoeet (Big Tree), and Satanta, the Kiowa, Comanche, and Southern Cheyenne tribes joined forces in several battles. Colonel Ranald Mackenzie led U.S. Army forces to round up or kill the remaining Indians who had not settled on reservations. On June 1874, a Comanche medicine man named Isa-tai called for a Sun Dance, even though that ritual had never been part of the Comanche religion. At that gathering, he and a young war leader of the Quahadi band of Comanches, Quanah Parker, recruited warriors for raids into Texas to avenge slain relatives of theirs. Other Comanche chiefs, notably Isa-Rose (White Wolf) and Tabananica (Sound of the Sun) of the Yapparika band and Kobe (Chief Wild Horse)of theDestanyuka band, identified the hide merchants as the real threat to the Indian way of life. They suggested that if Quanah were to attack anybody, he should attack the merchants. A war party headed west into the Panhandle of Texas. The Indians were repelled by long-range Sharps rifles. As they retreated, Quanah's horse was shot out from under him at five hundred yards. He was then hit by a ricocheting bullet that lodged in his shoulder. The attack on Adobe Walls caused a reversal of policy in Washington and led to the Red River War which culminated in a decisive Army victory in the Battle of Palo Duro Canyon. On September 28, 1874, Mackenzie and his Tonkawa scouts razed the Comanche village at Palo Duro Canyon and killed nearly 1,500 Comanche horses, a source of the Comanche wealth and power. Quanah in European-American business attire. With their food source depleted, and under constant pressure from the army, the Quahadi Comanche finally surrendered in 1875. With Colonel Mackenzie and Indian Agent James M. Hayworth, Parker helped settle the Comanche on the Kiowa-Comanche-Apache Reservation in southwestern Indian Territory. Parker's home in Cache, Oklahoma was called the Star House. Parker's was the last tribe of the Staked Plains or Llano Estacado to come to the reservation. Quanah was named chief over all the Comanches on the reservation, and proved to be a forceful, resourceful and able leader. Through wise investments, he became perhaps the wealthiest American Indian of his day in the United States. 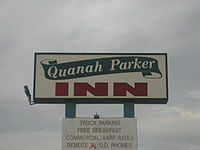 At this time, Quanah embraced much of white culture and adopted the surname Parker. He was well respected by the whites. He went on hunting trips with President Theodore Roosevelt, who often visited him. Nevertheless, he rejected both monogamy and traditional Protestant Christianity in favor of the Native American Church Movement, of which he was a founder. The story of the unique friendship that grew between Quanah and the Burnett family is addressed in the exhibition of cultural artifacts that were given to the Burnett family from the Parker family. The presentation of a cultural relic as significant as Quanah’s war lance was not done lightly. It is a clear indication of the high esteem to which the Burnett family was regarded by the Parkers. The correspondence between Quanah and Samuel Burk Burnett and his son, Tom Burnett, expressed mutual admiration and respect. The historical record mentions little of Quanah until his presence in the attack on the buffalo hunters at Adobe Walls on June 27, 1874. Fragmented information exists indicating Quanah had interactions with the Apache at about this time. This association may have related to his taking up the Native American Church, or peyote religion. Quanah was said to have taken an Apache wife, but their union was short-lived. The Apache dress, bag and staff in the exhibit may be a remnant of this time in Quanah’s early adult life. With the buffalo nearly exterminated and having suffered heavy loss of horses and lodges at the hands of the US military, Quanah was one of the leaders to bring the Quahada (Antelope) band of Comanches into Fort Sill during late May and early June 1875. This brought an end to their nomadic life on the southern plains and the beginning of an adjustment to more sedentary life. Burk Burnett began moving cattle from South Texas in 1874 to near present-day Wichita Falls, Texas. There he established his ranch headquarters in 1881. Changing weather patterns and severe drought caused grasslands to wither and die in Texas. Burnett and other ranchers met with Comanche and Kiowa tribes to lease land on their reservation—nearly 1 million acres (400,000 ha) just north of the Red River in Oklahoma. Originally, Quanah, like many of his contemporaries, was opposed to the opening of tribal lands for grazing by Anglo ranching interests. But, Quanah changed his position and forged close relationships with a number of Texas cattlemen, such as Charles Goodnight and the Burnett family. As early as 1880, Quanah was working with these new associates in building his own herds. In 1884, due largely to Quanah’s efforts, the tribes received their first “grass” payments for grazing rights on Comanche, Kiowa and Apache lands. It is during this period that the bonds between Quanah and the Burnett family grew strong. During the next 27 years Parker and the Burnetts shared many experiences. Burnett helped by contributing money for the construction of Star House, Quanah’s large frame home, which bore the inverted white stars signifying his rank. Burnett asked for (and received) Quanah's participation in a parade with a large group of warriors at the Fort Worth Fat Stock Show and other public events. The “Parade” lance depicted in the exhibit was usually carried by Quanah at such public gatherings. Burnett assisted Quanah in buying the granite headstones used to mark the graves of his mother and sister. After years of searching, Parker had their remains moved from Texas and reinterred in 1910 in Oklahoma on the Comanche reservation at Fort Sill. According to his daughter Wanada Page Parker, her father helped celebrate President Theodore Roosevelt's 1905 inauguration by appearing in the parade. In April 1905, Roosevelt visited Parker at the Star House. President Roosevelt and Parker went wolf hunting together with Burnett near Frederick, Oklahoma. During the occasion, the two discussed serious business. Quanah wanted the tribe to retain ownership of 400,000 acres (1,600 km2) that the government planned to sell off to homesteaders. (Quanah eventually lost this argument.) Quanah asked for help combatting unemployment among his people and later received a letter from the President stating his own concern about the issue. Finally, the wolf hunt was believed to be one of the reasons that Roosevelt created the Wichita Mountains Wildlife Refuge. Quanah took two wives in 1872 according to Baldwin Parker, one of Quanah's sons. His first wife was Ta-ho-yea (or Tohayea), the daughter of Mescalero Apache chief Old Wolf. He had wed her in Mescalero by visiting his Apache allies since the 1860s and had got her for five mules. After a year of marriage and a visit of Mescalero Apache in the Quohada camps, Ta-ho-yea asked to return home citing as her reason her inability to learn the Comanche language. Quanah sent her back to her people. Quanah's other wife in 1872 was Wec-Keah or Weakeah, daughter of Penateka Comanche subchief Yellow Bear (sometimes Old Bear). Although first espoused to another warrior, she and Quanah eloped, and took several other warriors with them. It was from this small group that the large Quahadi band would form. Yellow Bear pursued the band and eventually Quanah made peace with him. The two bands united, forming the largest force of Comanche Indians. Over the years, Quanah married six more wives: Chony, Mah-Chetta-Wookey, Ah-Uh-Wuth-Takum, Coby, Toe-Pay, and Tonarcy. A c. 1890 photograph by William B. Ellis of Quanah and two of his wives identified them as Topay and Chonie. Quanah had eight wives and twenty-five children (some of whom were adopted). After moving to the reservation, Quanah got in touch with his white relatives from his mother's family. He stayed for a few weeks with them, where he studied English and Western culture, and learned white farming techniques. Quanah Parker is credited as one of the first important leaders of the Native American Church movement. Parker adopted the peyote religion after having been gored in southern Texas by a bull. Parker was visiting his mother's brother, John Parker, in Texas where he was attacked, giving him severe wounds. To fight an onset of blood burning fever, a Mexican curandera was summoned and she prepared a strong peyote tea from fresh peyote to heal him. Thereafter, Quanah Parker became involved with peyote, which contains hordenine, mescaline or phenylethylamine alkaloids, and tyramine which act as natural antibiotics when taken in a combined form. Clinical studies indicate that peyocactin, a water-soluble crystalline substance separated from an ethanol extract of the plant, proved an effective antibiotic against 18 strains of penicillin-resistant Staphylococcus aureus, several other bacteria, and a fungus. Parker taught that the sacred peyote medicine was the sacrament given to the Indian peoples and was to be used with water when taking communion in a traditional Native American Church medicine ceremony. Parker was a proponent of the "half-moon" style of the peyote ceremony. The "cross" ceremony later evolved in Oklahoma because of Caddo influences introduced by John Wilson, a Caddo-Delaware religious leader who traveled extensively around the same time as Parker during the early days of the Native American Church movement. The modern reservation era in Native American history began with the adoption of the Native American Church and Christianity by nearly every Native American tribe and culture within North American and Canada as a result of Parker and Wilson's efforts. The peyote religion and the Native American Church were never the traditional religious practice of North American Indian cultures. This religion developed in the nineteenth century, inspired by events of the time being east and west of the Mississippi River, Parker's leadership, and influences from Native Americans of Mexico and other southern tribes. They had used peyote in spiritual practices since ancient times. Biographer Bill Neeley wrote: "Not only did Quanah pass within the span of a single lifetime from a Stone Age warrior to a statesman in the age of the Industrial Revolution, but he never lost a battle to the white man and he also accepted the challenge and responsibility of leading the whole Comanche tribe on the difficult road toward their new existence." Although praised by many in his tribe as a preserver of their culture, Quanah also had Comanche critics. Some claimed that he "sold out to the white man" by adapting and becoming a rancher. He dressed and lived in what some viewed as a more European-American than Comanche style. Quanah did adopt some European-American ways, but he always wore his hair long and in braids. He also refused to follow US marriage laws and had up to eight wives at one time. Quanah was never elected principal chief of the tribe by the people. Traditionally, the Comanche had no single chief. The various bands of the Comanche had their own chiefs. The US appointed Quanah principal chief of the entire nation once the people had gathered on the reservation and later introduced general elections. The Quanah Parker Society, based in Cache, Oklahoma, holds an annual family reunion and powwow. Events usually include a pilgrimage to sacred sites in Quanah, Texas; tour of his "Star Home" in Cache; dinner; memorial service at Fort Sill Post Cemetery; gourd dance, pow-wow, and worship services. This event is open to the public. 1970, Star House was listed on the National Register of Historic Places. An exhibit describes Parker and the Second Battle of Adobe Walls at the Hutchinson County Historical Museum in Borger, Texas. The Quanah Parker Trail, a public art project begun in 2010 by the Texas Plains Trail Region, commemorates sites of Comanche history in the Plains and Panhandle of Texas, the central region of Comancheria. "May the Great Spirit smile on your little town, May the rain fall in season, and in the warmth of the sunshine after the rain, May the earth yield bountifully, May peace and contentment be with you and your children forever." Nocona, Texas, was named after Quanah Parker's father, Comanche chief Peta Nocona. 1962, Parker Hall, a residence hall at Oklahoma State University. Parker Hall, a residence hall at Southwestern Oklahoma State University. The Quanah Parker Trailway (State Highway 62) in Southern Oklahoma. Quanah Parker Trail, a small residential street on the northeast side of Norman, Oklahoma. In Fort Worth, along the banks of the Trinity River, is Quanah Parker Park. The Quanah, Acme and Pacific Railway, which originated in Texas in 1902 and was later merged with the Burlington Northern Railroad in 1981. ↑ 1.0 1.1 1.2 1.3 1.4 1.5 1.6 1.7 1.8 "Parker, Quanah (ca. 1852-1911)". Encyclopedia of Oklahoma History and Culture - Oklahoma Historical Society. http://digital.library.okstate.edu/encyclopedia/entries/P/PA014.html. Retrieved 20 Dec 2009. ↑ 2.0 2.1 "The Last Comanche Chief: The Life and Times of Quanah Parker". Castle Books. September 2009. pp. 304. ASIN 0785822593. ISBN 978-0785822592. ↑ 3.0 3.1 S. C. Gwynne,Empire of the Summer Moon: Quanah Parker and the Rise and Fall of the Comanches, the Most Powerful Indian Tribe in American History (May 2010), Scribner, New York, pp 13, 96. ↑ Dixon, Olive King (1927). Life of Billy Dixon. Austin, Texas: State House Press. pp. 186. ISBN 0-938349-11-2. ↑ Quanah Parker Star House, Preservation Oklahoma, Inc.
↑ 7.0 7.1 7.2 David Minor, "Burnett, Samuel Burk, Handbook of Texas Online , accessed May 15, 2013. Published by the Texas State Historical Association. ↑ "Roosevelt's Wolf Hunt". Encyclopedia of Oklahoma History and Culture - Oklahoma Historical Society. http://digital.library.okstate.edu/encyclopedia/entries/R/RO026.html. ↑ "Peyote: An Account of the Origins and Growth of the Peyote Religion". Thomas Y. Crowell Co.. 1971. pp. 111. ASIN B0044EQFKC. ↑ McCleary, J.A. ; Sypherd, P.S. ; Walkington, D.L. (1960). "Antibiotic Activity of an Extract Of Peyote [Lophophora williamsii (Lemaire) Coulter]". pp. 247–249. ↑ "Quanah Parker Dead. Famous Comanche Chief Once Entertalned Ambassador Bryce". February 24, 1911. http://select.nytimes.com/gst/abstract.html?res=F00814F9385517738DDDAD0A94DA405B818DF1D3. Retrieved 2011-05-26. "Quanah Parker, the famous chief of the Comanche Indian tribe, died at his home here today of pneumonia Quanah Parker's mother was a white girl who was ..."
↑ Oklahoma Department of Transportation. "Oklahoma's Memorial Highways & Bridges - P Listing". http://www.okladot.state.ok.us/memorial/htmls/listp.htm. Retrieved 2010-06-02. Wikisource has the text of a 1900 Appletons' Cyclopædia of American Biography article about Quanah Parker. Wikimedia Commons has media related to Quanah Parker. Tom Todd (Jan 01, 2001). "Quanah Parker". Native American Folk Figure. Find a Grave. http://www.findagrave.com/memorial/1371. Retrieved Aug 18, 2011.